Do you think it’s a good opportunity to close the gaps in understanding, to brush up essential skills of key topics, ultimately get the students ready for studies and exams in Sec 4 during this holiday? 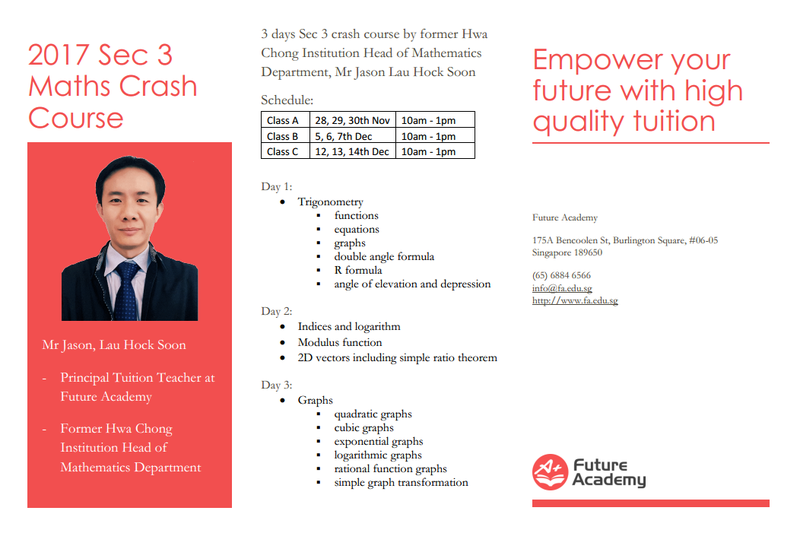 Here is our Nov/Dec 2017 Sec 3 Mathematics Crash Course specially designed and coached by former Hwa Chong Institution Head of Math Department, Mr Jason Lau Hock Soon. Students will be coached by well known teacher Jason Lau (more information about Jason Lau) and will benefit from the well designed topics, small class size (maximum 8 students) as well as customised coaching. Limited vacancy! Register immediately to avoid disappointment. Know more about our course?